"Bring the world's most luscious fragrances to your home with Oojra"
Feel amazing with continual essential oil scent you never need to turn on, watch, or plug in. 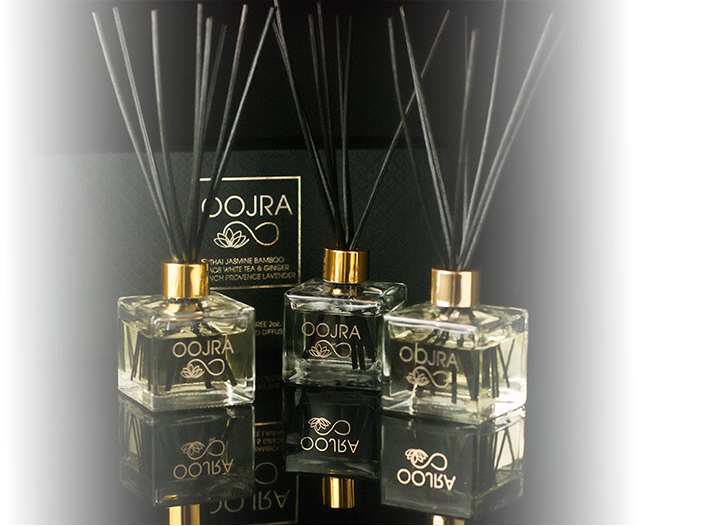 Oojra reed diffusers are ideal for offices, entryways, bathrooms, closets, and areas you move in and out of frequently. Fantastic aromatherapy made easy. Enjoy the flickering, calming candle light of our 100% soy wax, essential oil candles. Perfect for entertaining guests, accenting great rooms, cozying reading nooks, soaking in the bath and curating other areas into spaces where you can stay and enjoy the dancing flame and delightful aromatherapy. Oojra empowers people to create the perfect ambiance in their space with our line of healthy, sophisticated home fragrances, all inspired by the world’s most luxurious scents and destinations. People often feel the need to ‘get away’, to rejuvenate, to relax and regain their creativity and drive. Oojra brings this to your home or office with the power of the best essential oil reed diffusers and soy candles. Scent is our most powerful sense in influencing our emotional state. Certain scents can make us happy, relaxed, connected, romantic, creative, inspired, driven, and even productive. Oojra combines the power of scent with luxurious design to empower each of our clients with the ability to curate their perfect space and give meaningful gifts to those they care about. Scent is the final layer of décor, and with luxurious Oojra reed diffusers or soy candles our clients have an aromatherapy experience that helps them feel their best, and bring their inspirations and creativity to life. The memorable gift perfect for holiday hosts, clients, friends, family and even Secret Santa surprises. Give the gift that will make them feel amazing for months to come. Have a healthy aromatherapy experience with Oojra reed diffusers and soy candles that effectively cultivate the mood and emotions you want with our natural ingredients, including essential oils, 100% soy wax, cotton wicks, and natural reeds. Our reed diffusers and soy candles are free of paraben, paraffin, phthalate, and other toxic ingredients… things other brands have that can impact your health. We use 100% soy wax with zero paraffin, unlike most soy candles. So happy I just want to close my eyes and smell!!! Oojra gift boxes are soft to your fingertips and solid in your hands, and they look great without wrapping paper. Combine this with incredible aromatherapy, and the lucky people you gift Oojra to will love their sophisticate soy candle or reed diffuser. They will remember your generosity every time the aroma wafts across their path for months to come. We care about the environment and strive to make our products as environmentally friendly as possible. The glass and metal candle votives are reusable, the packaging is recyclable, and the wax is paraffin (petroleum) free. This makes your aromatherapy experience kinder on the environment, and a guilt free pleasure to give and use.